The Mio c210 Digiwalker in car Satellite Navigation device looks like a little beauty, just a little larger than Garmin's excellent i3, so how does is compare vs that excellent Navigation Device? It comes pre-installed with maps of UK (not Ireland) and main roads in Europe, it uses 7 digit (full) Post Code look-up, so entering destinations is very simple on the clear & bright touch-screen. The unit runs off your cigar lighter, or 4 internal AA batteries. It does not have a rechargeable battery inside it, so the unit does turn off when you switch your ignition off when its using external power. The windscreen mount is the usual type, and fitted well to our test vehicle. Initial start-up time was 3 minutes, and after that it picked up a GPS signal very quickly. The Mio c210 was a pleasure to use, even if the speaker was a little quiet on noisy roads. I used the POI feature to navigate to several different petrol stations, and the information was correct. Mio offer free Speed Camera POI subscription for a year with the c210, so you could save a lot of money on fines! The Mio c210 Sat Nav dealt with wrong-turns well, and as is usual it has all the customizable functions for vehicle type, speed, etc. Multiple stop routes are easily entered, unlike some budget GPS systems, so it could be used by Delivery Drivers as well as normal road users. 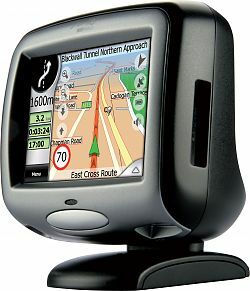 Would I recommend the Mio c210 over TomTom, Navman, Garmin, etc? It is a very good price, cheaper than all the Tom Toms, and it compares very well with the Garmin i3. In comparison with the Navman c330, it is much better. Conclusion? You won't get much better at this price point, just make sure you fit those batteries so it doesn't keep turning off! i have lost my manual for my mio c210 sat nav is there any way i can down load it.